Dabbing is loads of fun. Mix that with creating multiplication arrays and you have a combination for some great fact practice! There is a PDF for each fact family 1-12 and a mixed math activity that has the students determine the fact statement based on the array they need to build. Laminate all the colored sheets (there are 168!!) and use them as workmats with counters, dry erase markers or bingo daubers. A black and white version (another 168 pages!) is included for individual student practice. 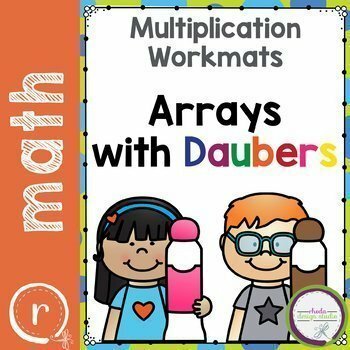 They can use pencils, crayons, markers, or daubers to complete their multiplication practice! This set is great for review, independent practice, and math centers!